By romein, February 21, 2008 in Plugins - Publishing ONLY! Unsharp masking is a traditional film compositing technique used to sharpen edges in an image. The Unsharp Mask filter corrects blurring introduced during photographing, scanning, resampling, or printing. It is useful for images intended for both print and online viewing. Luminance only - Use this option to apply the effect only to the luminance channel. 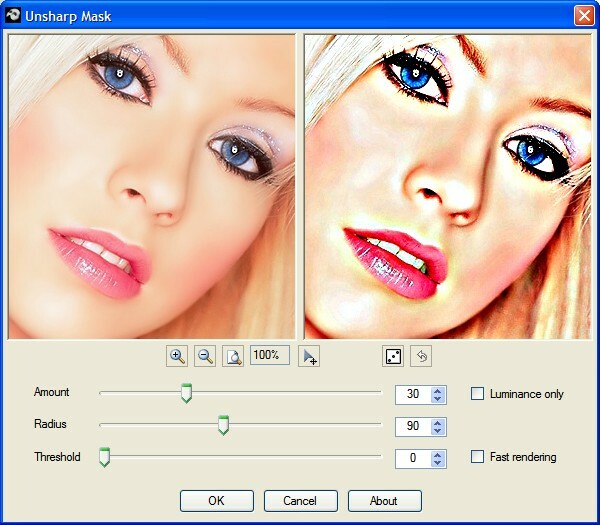 The unsharp mask can have a negative effect on the color balance when applied to the color data. Looks very impressive, both the effect and the UI controls. I'll try it once I get home from work. edit: wow, I posted before d.a did! all those nights of no sleep catching every post first must've caught up with him! I already have ”Sharpen+” and it works very well. But I am going to give this a try next time. I love your icon for this. :-) Can't wait to use it. Do you mind posting the source? Love the UI, good job.